With vehicle details so we can help ensure this part fits your vehicle - we aim to respond within 2 working hours. 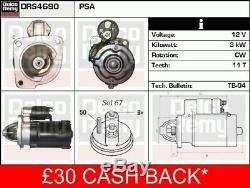 LDV 400 2.5D Starter Motor 86 to 98 Remy. 192.0 / 21.7 mm. 0 001 218 100, 0001218100, 0 986 014 690, 0986014690, 0 986 014 691, 0986014691, BX1469. ARO 240-244 2.5 TD. DAF 400-Serie Box 428-435 2.5 D. DAF 400-Serie Box 428-435 2.5 TD. LDV 400 Box 2.5 D. LDV 400 Bus 2.5 D. LDV 400 Bus 2.5 TD. LDV 400 Platform/Chassis 2.5 D. LDV 400 Platform/Chassis 2.5 TD. PEUGEOT 505 (551A) 2.5 Turbo Diesel. PEUGEOT 505 Break (551D) 2.5 Diesel. PEUGEOT 505 Break (551D) 2.5 Turbo Diesel. PEUGEOT 604 (561A_) 2.5 TD. Some of the materials in this product can be recycled but it involves some effort on our part and yours too. That's why we are offering our customers a cash back incentive to ensure that as much as possible is recycled, thereby minimising environmental impact and saving the planet! The cash back is payable on receipt of the old unit - see quality guidelines which must be adhered to here. The item "LDV 400 2.5D Starter Motor 86 to 98 Remy Genuine Top Quality Replacement" is in sale since Monday, December 11, 2017. This item is in the category "Vehicle Parts & Accessories\Car Parts\Electrical Components\Starter Motors". The seller is "carpartsinmotion" and is located in Leeds, United Kingdom. This item can be shipped to all countries in Europe, Australia, United States, Canada, Brazil, Japan, New Zealand, Israel, Hong Kong, Indonesia, Malaysia, Mexico, Singapore, South Korea, Taiwan, Thailand, Saudi arabia, South africa, United arab emirates, Chile.